Dr. Guy McAninch graduated from Sherman College of Chiropractic in June 2002. He hit the ground running immediately, opening a high-volume office in Charlotte, North Carolina. As the years went by, he realized that he wanted a more laid-back lifestyle and to spend more time with each of his patients. 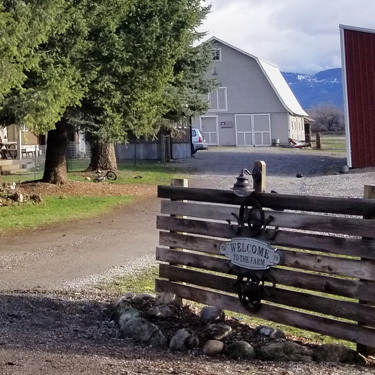 When the opportunity arose to buy a farm in Idaho, his family was thrilled. At Farm & Table Chiropractic, you’re coming to our farm to get on the table—the adjusting table, that is! Every member of the family, including Dr. Guy’s children, run the farm. You will probably meet some of them if they stop by the office during your appointment. Their goal is to produce healthy, nourishing food grown on the farm. While chiropractic addresses your structure, the yields from the farm will nourish your body. They hope to have a variety of delicious bounty available for purchase soon! Dr. Guy welcomes everyone, from newborns to seniors to his chiropractic care center. One of his favorite stories is about a patient who was still affected by bed-wetting at age 14. The boy’s confidence has understandably taken a hit, and he worried nonstop. His mom heard chiropractic might help and tried it as a last resort. After two adjustments, the bed-wetting stopped. Many babies can benefit from chiropractic, too. Issues like failure to thrive, colic, nursing difficulties and sleeping troubles may be resolved with his natural approach to true health care. If you’re interested in learning what chiropractic can do for you, text Dr. Guy today! He’ll get you scheduled for your appointment as soon as possible.